There are few people in music who manage to juggle as many projects as Mark Lanegan. 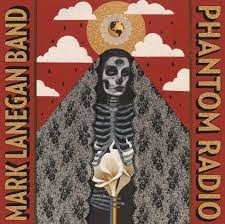 Well the former Screaming Trees singer has found some time to release an album of new material from his own Mark Lanegan Band in the form of the brooding new record Phantom Radio. Some electronic influences bubble to the surface on this album. A heavy '80s techno goth pop inspiration can be felt on "Floor of the Ocean". We get a menacing taken on Trip Hop with "The Killing Season". A pulsing, but not overwhelming beat drives "Dry Iced". The electronic edge hits it's apex on "Death Trip To Tulsa". An outstanding keyboard riff crashes with a fierce, prowling arrangement to show off Lanegan's ghoulish best. While this is a gloomy album to say the least, there are some spiritually redeeming moments. "Seventh Day" absolutely heaves towards heaven. A halo seems to form around the vocals on "Torn Red Heart" as Lanegan creates what could be the best sad song of the year. Phantom Radio is a flawed record though. The vocals are nearly inaudible on the funeral procession "Judgment Time". "I Am the Wolf" is glacial in tempo. Lanegan's vocals take on a strangely Neil Diamond-esque timbre on "The Wild People", which is difficult to get passed. The early Screaming Trees grunge sound seeps onto a couple of tracks. "Sad Lover" is the only flat out rocker on the record, while the swirling, marching "Harvest Home" sees Lanegan belt it out like the good old days. After all is said and done, it's great to have Mark Lanegan back giving us some music from a project he can completely direct on his own. Best tracks: "Torn Red Heart", "Death Trip To Tulsa"